Here’s why you should VOTE NO on Austin’s Proposition 1. Update: Proposition 1 failed decisively. I’m not happy about this; I wish there had been a good rail option on the ballot that we all could have supported. If you’d like to see one on the ballot in the next election, tell your new city council member, and view or sign the petition at AustinNeedsTransit.com. There are many reasons to oppose Austin’s upcoming bond for a light rail line, even if you support having light rail in Austin. Here are some of the most commonly-asked questions. Also known as Project Connect, Prop 1 is a proposed $1 billion bond for city transportation. Of this amount, $600 million would help to build a 9.5-mile light-rail line, while $400 million would pay for various road improvements (some of which are directly related to the rail). The “urban rail” which we oppose includes 16 stations that connect Riverside Drive, San Jacinto Blvd, Hancock Center, and ACC Highland. You can see a map here. Why are pro-rail advocates against this plan? Rail advocates don’t support trains at any cost; we want to use our tax dollars wisely. First and foremost, the Project Connect rail is not cost-effective. 20,000 boardings per day sounds impressive, but since most will be two-way trips, it would actually serve between 8,000 and 10,000 Austinites. And at $1.4 billion, this would be the third-costliest light rail “starter line” in history ($147M per mile). It would very simply be much more expensive to build and operate than it would be to use buses to move the same people to the same places. An effective rail system, like the very successful one in Houston, should cost the same or less. But how is this plan “worse than nothing”? It will help out some! We say Project Connect is worse than nothing because it wastes our limited transportation funds, costing hundreds of millions of dollars more than an equivalent MetroRapid bus line would. If implemented, the operating costs of this system will take funds away from the rest of the transit service, weakening public transit overall. We’ll be spending a lot of money to move 8-10k Austinites while the whole city needs better transit. An analysis by transit advocate Julio Gonzalez projects that overall Capital Metro ridership in Austin will most likely drop significantly due to this shift of funds. Additional analysis by AURA estimates that this train’s operating expenses will be equivalent to a permanent 10% cut in general bus service. There is also virtually no chance that Project Connect will relieve congestion. In the best possible case it will slow the growth of congestion very slightly. If it reduces overall ridership, though, then more Austinites will take their cars, and congestion will increase. But Project Connect serves many important destinations including the Capitol, UT, the Erwin Center, and ACC Highland. A successful rail route should be as high-density as possible. The Project Connect route does indeed cover some high-traffic areas. Others, like the Erwin Center and DKR stadium, are only busy at certain days and times. Still others, like single-family housing or the state-owned “parking garage district” between 12th and MLK, have very low density and are unlikely to be developed in the foreseeable future. Here is a useful map indicating the density of stops along the light-rail corridor. The UT campus deserves a specific comment. By running down San Jacinto this rail line would be over half a mile away from West Campus, one of the highest-density areas in the city where almost 20,000 Austinites (and 20% of UT students) live. According to transportation experts, a half-mile radius is the maximum distance that most people are willing to walk in order to use a rail line. West Campus would be unlikely to use this light rail in significant numbers. We have to start somewhere! We can expand the line later. There are indeed concepts to expand the rail in the future to the airport, Mueller, East Austin, and up Guadalupe and Lamar. Project Connect already has them on its map. However Proposition 1 is the largest bond proposal in Austin’s history, and it would consume Austin’s bonding capacity for the near future. So, even if Project Connect is a roaring success, it will be a decade or more before Austin could literally afford to pay for another line, and perhaps two decades before it’s built. If we approve Prop 1, it will be the only rail Austin has for a long time. The areas served by Project Connect will grow in the future. Don’t be short-sighted. It’s true that the Highland area in particular might grow significantly in the next decade, with ACC Highland being the first piece. However Project Connect’s own estimates—16-20 thousand boardings per day—already include some very optimistic growth “baked in.” For example, Capital Metro projects that the population of the Highland area will double by 2030, which frankly is unlikely. Other areas, like Riverside, actually seen their population decrease. In other words, growth is not a guarantee, and it’s entirely possible (even likely) that Project Connect ridership will be much lower than predicted. The presence of a rail line alone is not enough to guarantee high-density growth in a given area. Light rail lines like those in San Jose and Baltimore average fewer than 1,000 daily riders per mile, and were built (in 1987 and 1992, respectively) with the expectation that the areas near the rail would grow dramatically. They did not, and both rail lines now operate at a heavy loss. “The perfect is the enemy of the good.” This rail line is good enough. The bad is also the enemy of the good. As previously stated, this rail line would waste money that could be spent on more efficient and effective transit projects. The MetroRail Red Line has become a big success. So would this light rail. The Red Line commuter rail (opened after a long delay in 2010) certainly appears to be a great success. It runs at full capacity during rush hour, and Capital Metro plans to purchase additional cars for it. However, this masks an uncomfortable truth: its ridership is still well below Capital Metro’s initial estimates. Millions of tax dollars are being poured into the Red Line to keep it running. It has an “operating subsidy” of $17 per boarding, which means that for every Austinite who uses the train, Capital Metro loses $17. This is much higher than the subsidy for the express buses that it replaced. If you wonder why MetroRail doesn’t have longer hours, or hasn’t been expanded to Manor as previously promised, it’s because it costs too much to run. The same is true for Project Connect. Your tax dollars would be spent keeping the line running for those who use it, whereas high-capacity buses could almost pay for themselves. Why do I hear so much about rail on Guadalupe and Lamar? Most people are familiar with this route (as well as Congress Ave.) as the proposed light-rail line in 2000. 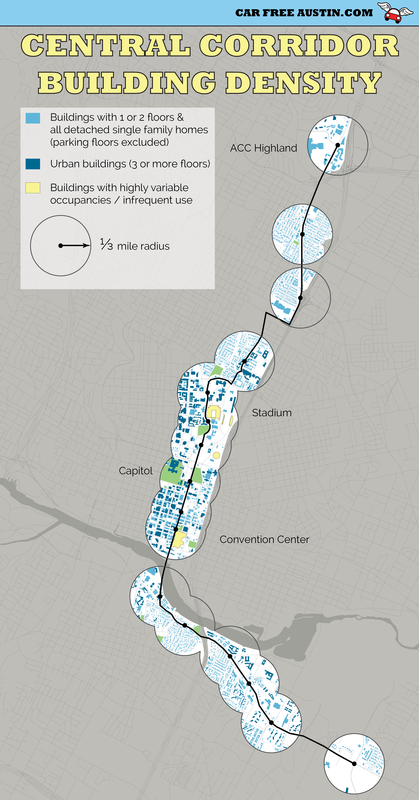 The Guadalupe-Lamar corridor is the densest population center in the city of Austin, making it a natural choice for a dedicated mass-transit option like light rail. According to the best estimates, a rail line along this corridor would move many more riders for significantly less money. Most objective transit experts agree that “Guad-Lamar” is the best choice for a rail line in Austin. It’s the easiest basis for comparison. However it’s important to note that Project Connect is a poor investment compared to any successful light rail, not just this one. Our opposition to Prop 1 is unrelated to our preference for Guad-Lamar. We heard the same anti-rail arguments in 2000. This is only true in the most superficial sense. The light rail plan in 2000 had all of the strengths that the Project Connect route lacks. It would move more people, and save tax dollars instead of wasting them. It’s notable that there was no opposition to the 2000 plan from rail and mass-transit advocates; the same cannot be said about this proposal. If Proposition 1 fails, then we won’t have another rail on the ballot for a long time! There is no reason to believe this. In 2000, Austin’s rail vote failed by a slim margin. An alternate proposal (MetroRail) appeared on the ballot only four years later and passed. However, even if this were true, the Project Connect rail plan is worse than nothing. It’s better to reject this rail plan than to make transit worse in Austin. What comes next if Proposition 1 fails? We support building Bus Rapid Transit (known as BRT) along much of the Project Connect corridor, using high-capacity buses similar to the new 801 and 803 routes. BRT on the Project Connect corridor could potentially have dedicated right-of-way lanes, so the buses wouldn’t be stuck in traffic. We also support researching rail options along Lamar, Guadalupe, and Congress. Most generally, though, we support visions for Austin transportation that are bold and cost-effective. AURA, Our Rail, and Austin Rail Now are advocacy groups that favor rail transit in Austin, but oppose Proposition 1. Julio Gonzalez has written a simulation that estimates Prop 1’s negative impact on Capital Metro (also linked above). He has also written a similar blogpost to this one that goes into the numbers in much greater detail. Car Free Austin has an informative blog series analyzing the Project Connect route in detail (parts 2, 3, and 4). 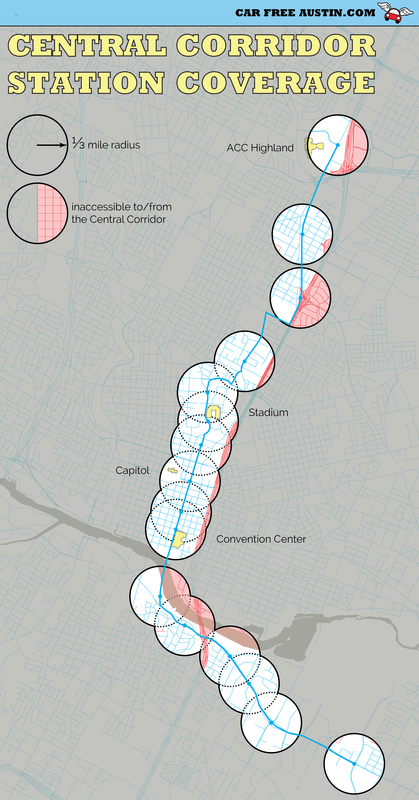 The Central Austin CDC has an alternate proposal for rail on Guadalupe-Lamar. Or you can email the author, Kevin Miller. I’m @happywaffle on Twitter. I wrote this FAQ with help from advocates like myself, and I’m a dues-paying member of AURA. Responsibility for the contents of this page is mine alone, and I would love your feedback.